Developers, The Outisders have revealed their debut game Darkborn over at IGN. 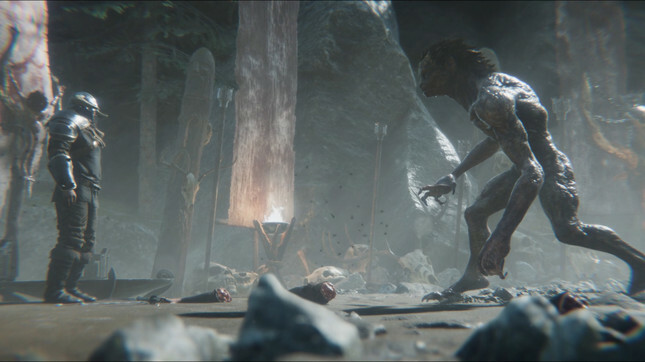 Developed under the codename Project Wight, Darkborn is a narrative-driven action game with a welcome twist in which players will take control of a monster out for revenge. The game is currently in pre-alpha with plenty of development still to come. Gameplay is said to be a mix of first-person stealth and action and will task players with taking revenge on the Norse-inspired humans occupying the world. The developers have revealed the foundation for the game's story, which will see the titular monsters world torn asunder and will see them growing and evolving throughout the journey as they gain new abilities to aid in the execution of its wrong-doers. With a small team of only twenty-five staff, development on Darkborn is already three years in and is shaping up to be a much-welcome and unique gaming experience. I'm already interested in the premise alone and am loving the creature design we've seen so far. I can't wait to see how the titular monster evolves and if the developers can bring their excellent ideas to fruition. Check out the full story via IGN and the new gameplay below!